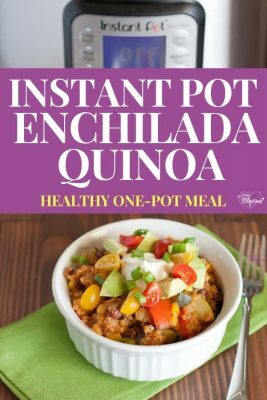 This Instant Pot Enchilada Quinoa Recipe is a healthy one-pot meal Mexican dish that makes for a nutritious and easy weeknight dinner idea. I have become pretty passionate about one-pot meals this year. 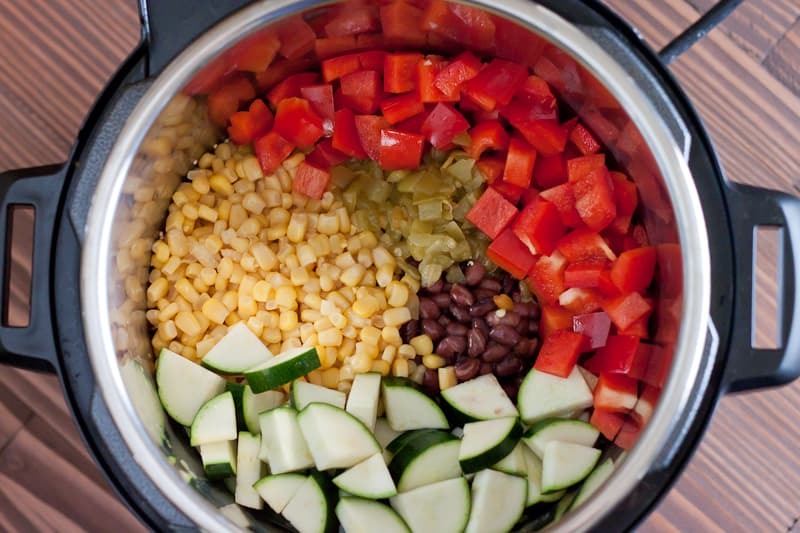 And, of course, the one-pot meals I cook have to be healthy. To me, that means the dish needs to be packed full of both protein and vegetables. 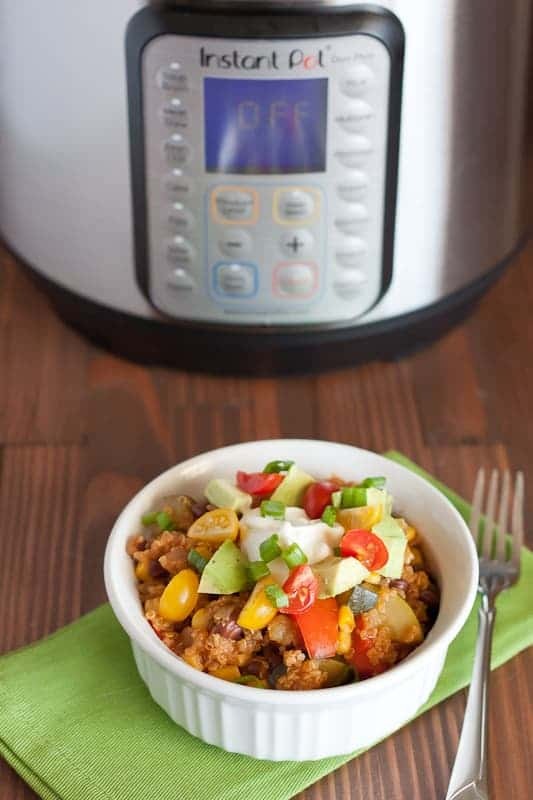 This healthy Instant Pot recipe is a one-pot meal that is full of protein from the quinoa and black beans. 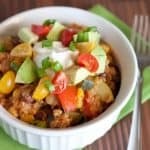 It also packs a powerful veggie punch with onions, bell peppers, zucchini with the flavor of green chiles and enchilada sauce. 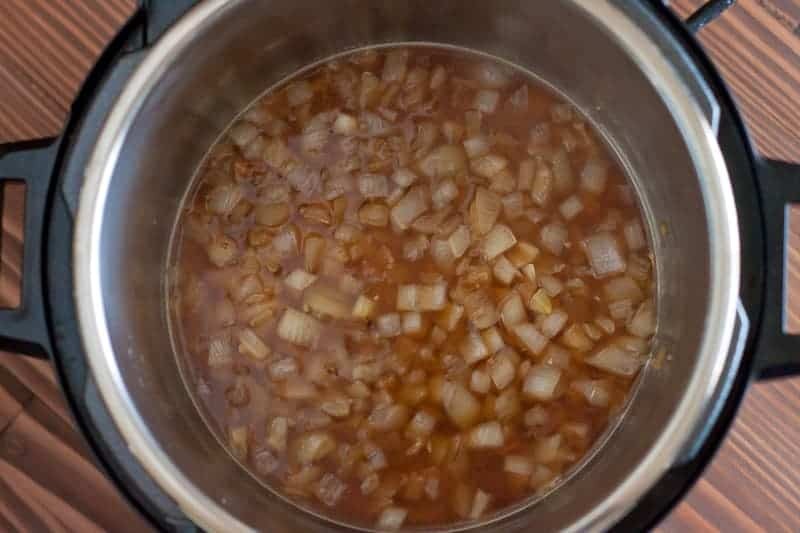 First, preheat your pot and saute the onions and garlic in a little bit of oil. I use avocado oil because it is full of healthy fats and it has a really high smoke point (meaning you won’t lose nutrients when you cook with it). Add in your broth and deglaze your pot, making sure there are not bits stuck to the bottom. 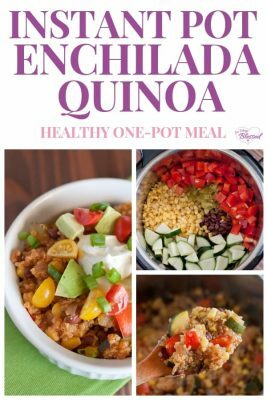 Now pour in your uncooked quinoa. I like to buy my quinoa either at Costco or when it’s on sale at Sprouts. 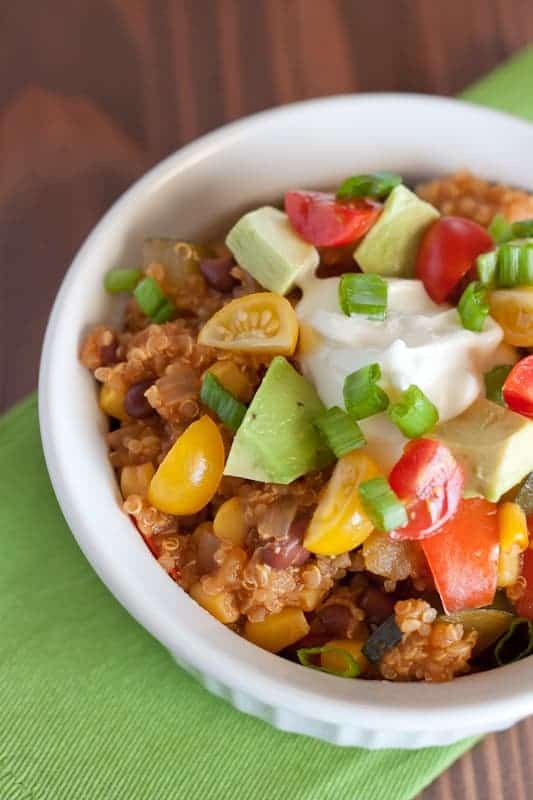 Quinoa is one of my favorite healthy superfoods because it is high in both fiber and protein. Now add in all of the colorful stuff! This is when “taste the rainbow” gets delicious. Different colors in veggies bring different nutrients, so eating a variety of vegetables is super beneficial for keeping your whole body running smoothly. Next, pour in the enchilada sauce (no need to stir!). A quick side note – I am a wimp when it comes to spice. When I make this for myself, I use mild green chiles and mild enchilada sauce. If you prefer more spice (like my husband! 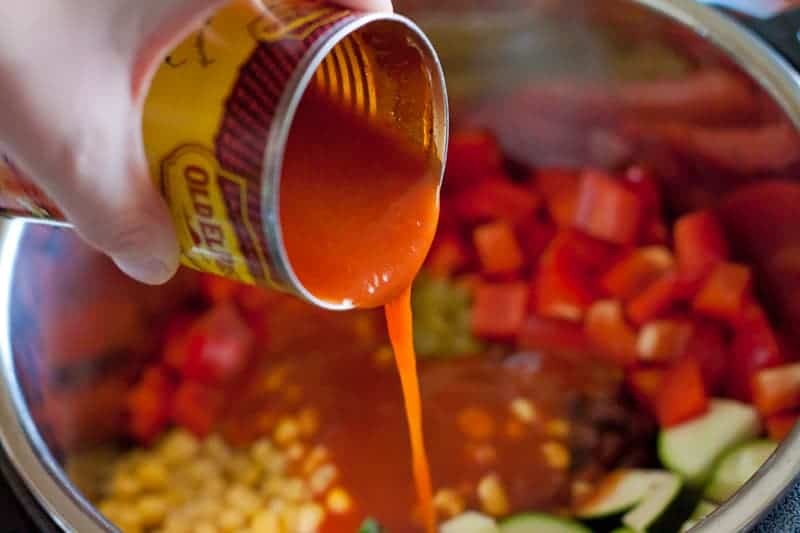 ), you can either add salsa or hot sauce at the end, or just use the spicier variety of chiles and enchilada sauce. Now, just close the lid (make sure the valve is set to sealing!) and set the timer for 2 minutes. I tested this recipe quite a few times because the pesky BURN message kept appearing. If you follow these instructions exactly, you should be good to go! 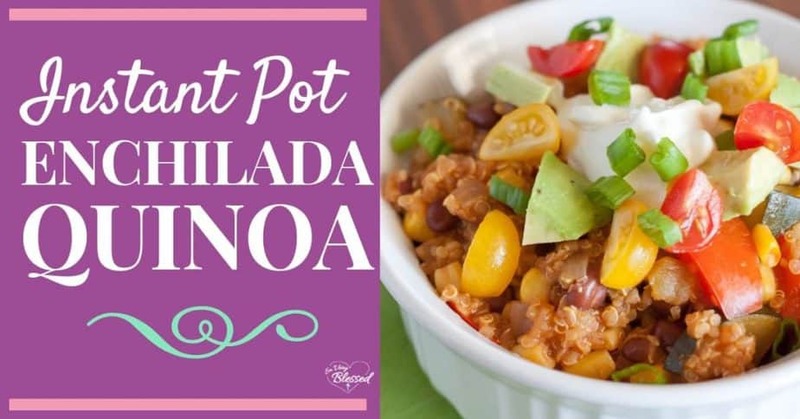 Make sure you deglaze the pot completely when you pour in the broth and don’t stir the vegetables or enchilada sauce when you add it. 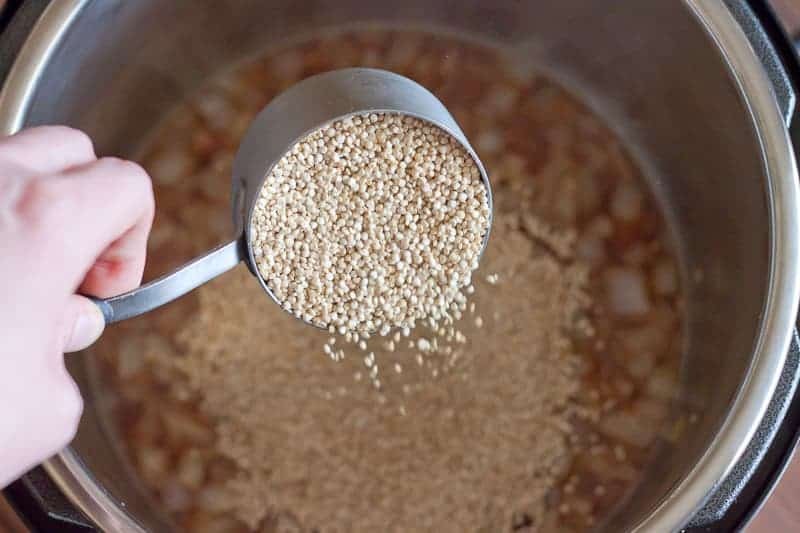 Let the pressure naturally release (it took my pot about 15 minutes to fully release) and you’ll be left with a perfectly cooked pot of delicious quinoa. 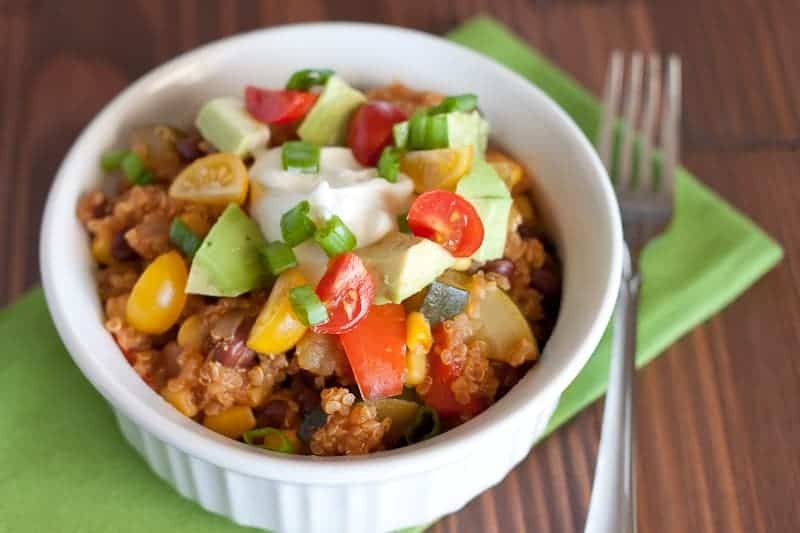 I like to add avocado, plain Greek yogurt (an awesome sour cream substitute! ), diced green onions, and chopped cherry tomatoes on top. The toppings make it even more delicious, add some great texture, and make it so pretty to look at. 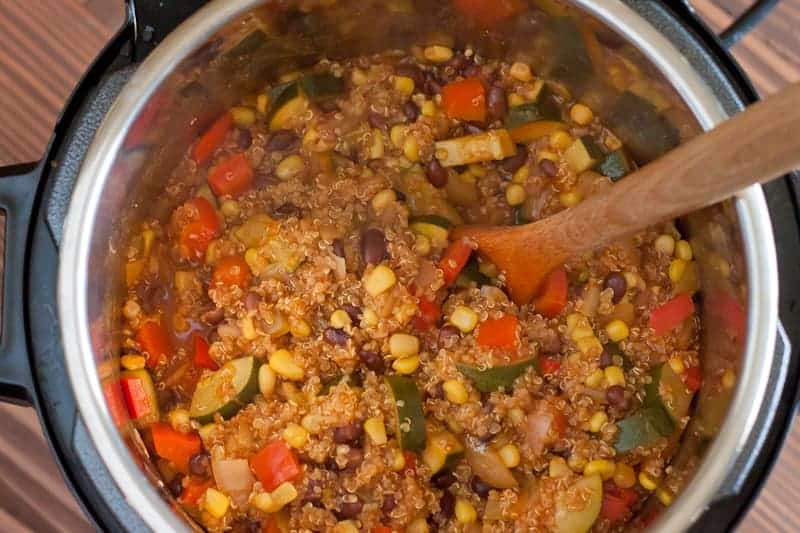 This is a great recipe to use for healthy weekly meal prep! The leftovers reheat beautifully, so I like to make a pot on Sunday and eat it for lunch during the week. 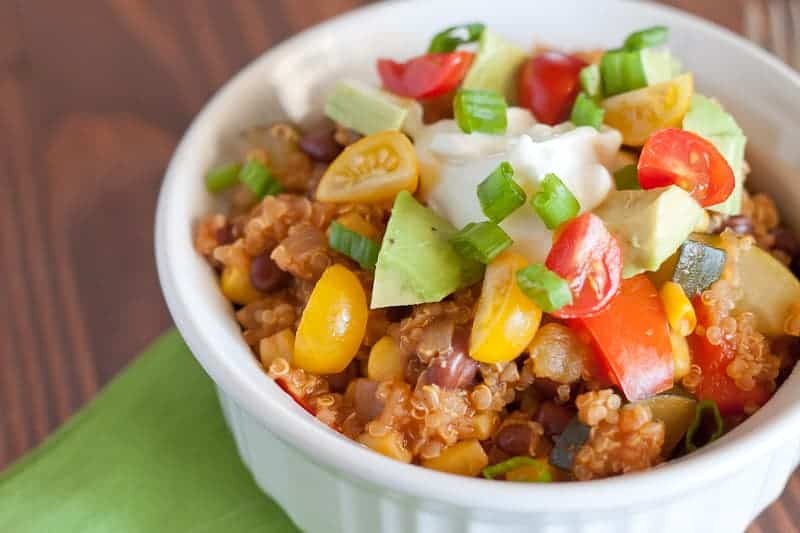 You can pair it with grilled chicken or leave it as-is for an easy Meatless Monday meal. 1. Press the “Sauté” button and wait for your Instant Pot to preheat. 2. Add the oil and sauté the onions and garlic for 2-3 minutes. 3. 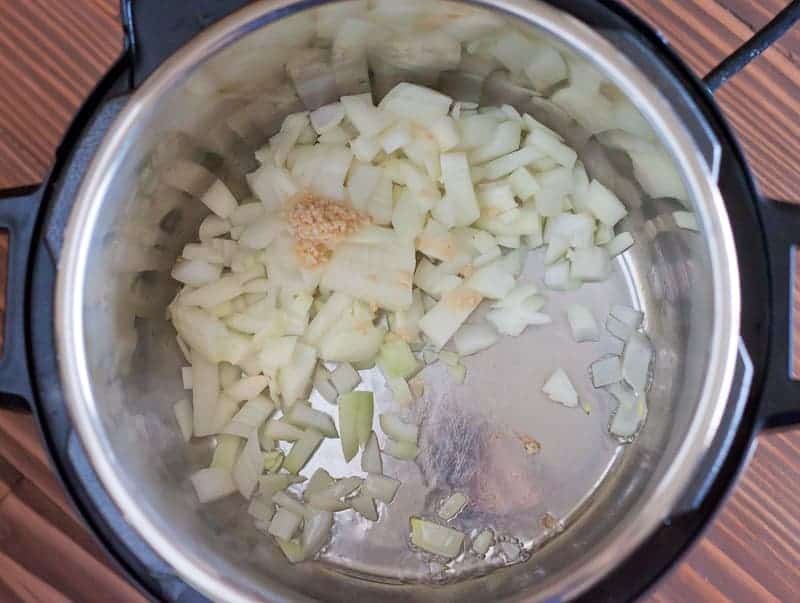 Press the “Cancel” button, add broth and scrape the bottom of the pot to make sure there are no stuck bits of onion or garlic. 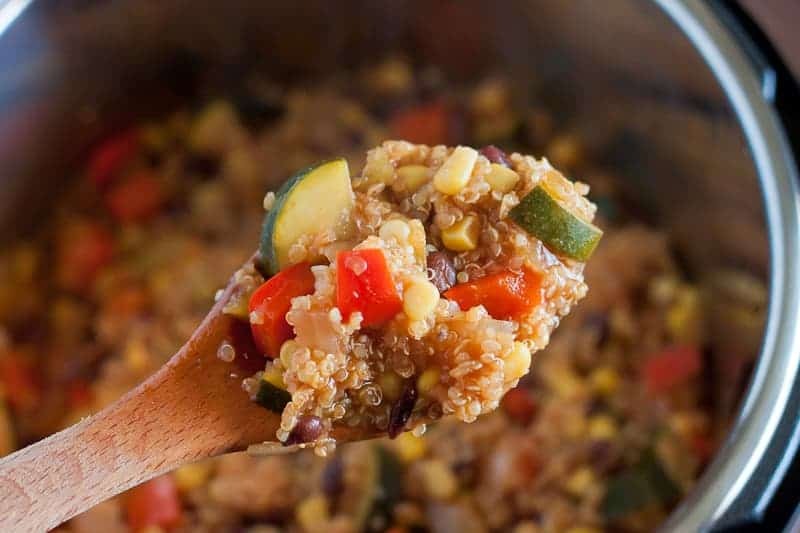 Stir in rinsed quinoa. 4. Add the remaining ingredients to the pot, but don’t stir. 5. Making sure the valve is set to “Sealing,” set the pot to high pressure and set the time for 2 minutes. 6. When the cooking cycle is complete, allow the pressure to release naturally for 15 minutes, then quick release any remaining pressure.